He can sleep 4 people comfortably 2 in the R&R bed & 2 in the lift up roof (weight limit applies). You could also sleep a baby or small child on the cab bunk, please ask for details. With the optional drive away awning he can accommodate up to 7 people, however only 4 main seat belts are fitted in the camper. The majority of the original interior has now been removed and replaced with modern seating, units, table and lighting. In addition a Smev cooker and sink unit is fitted and a modern fridge. There is 240v power points and a DAB digital radio / CD player with USB input. Both engine and gearbox have been replaced with reconditioned units to ensure mechanical reliability. Despite the addition of these modern features Campbell still retains the character and feel of the original camper. returned to us and return condition checked. A refuelling service charge of £25 and the fuel cost to refill the tank with unleaded petrol. us, you must telephone to let us know, as you may not be insured for your additional time. 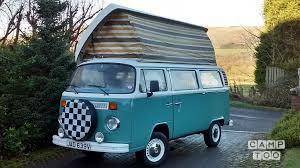 A full valet fee of £50 if the camper van is not returned in a clean condition. Road tolls or fines for charges arising from traffic or parking offences during the rental period. Costs of obtaining replacement keys (and any associated costs) during the hire period. Je kan de camper ophalen in Dollar bij Sarah.